Sustainable consumption seems an unstoppable force. However, on average, consumer behavior has not y..
Luise Hübbe Chief Digital Officer, EMEA Geometry GlobalLuise.Huebbe@geometry.comThere is dynami..
Andreas WittenbergHead of Sales MRA, EMEALIGHTSPEEDAndrea.Wittenberg@lightspeedresearch.com Des..
Hartmut SchefflerMD / CMOKantar TNSHartmut.Scheffler@Kantartns.com It is not just Procter &..
Claudia GelbeClient DirectorKantar Millward BrownClaudia.Gelbe@kantarmillwardbrown.com A watchf..
Dr. Niels NeudeckerHead of Global Connect CentreKantar TNSNiels.Neudecker@Kantartns.com Digitiz..
Dr. Markus GräßlerManaging Directorgkk DialogGroup, Frankfurt&Tina HerrchenDirector S..
Hartmut SchefflerMD / CMOKantar TNSHartmut.Scheffler@kantartns.com The number of contact points..
Tobias PhlepsCEOBrand UnionTobias.Phleps@brandunion.com & Kathleen IxSenior Innovation..
Dr. Peter LudwigHead of Brand & CommunicationKantar TNSPeter.Ludwig@kantartns.com After the..
Joachim BaderCEO Central EuropeWundermanJoachim.Bader@wunderman.comIntelligent, voice-controlled hel..
Why individuality still matters for car brandsLukas HartmannStrategy Director & New Business Dir.. The new battleground for brand managementKim FlorioCSO, DüsseldorfGreyKim.Florio@grey.com ..
How brands can negotiate the new generation gapTobias PhlepsCEO, GermanyBrand UnionTobias.Phleps@bra..
Christoph SchuppManaging Director, GermanyBurson-MarstellerChristoph.Schupp@bm.com & A..
Carena BongertzTransformation DirectorScholz & FriendsCarena.Bongertz@s-f.com The prevalenc.. The value of media intelligence in the modern era Michael MaillingerManaging Director & Cou..
SAPCompany: SAP SEBrand value: US$48,943 millionHeadquarter city: WalldorfCategory: Technology..
Deutsche TelekomCompany: Deutsche Telekom AGBrand value: $39,215 millionHeadquarter city: BonnCatego..
BMWCompany: Bayerische Motoren Werke AGBrand value: US$24,606 millionHeadquarter city: MunichIndustr..
Mercedes-BenzCompany: DAIMLER AGBrand value: US$23,587 millionHeadquarter city: StuttgartCateg..
DHLCompany: Deutsche Post AGBrand value: US$18,344 millionHeadquarter city: BonnIndustry: LogisticsY..
SiemensCompany: Siemens AGBrand value: US$15,224 millionHeadquarter city: Berlin/MunichCategory: Con..
ALDICompany: AldiBrand Value: US$12,893 millionHeadquarters: Essen (Aldi Nord) and M&..
adidasCompany: Adidas AGBrand value: US$11,820 millionHeadquarter city: HerzogenaurachCat..
BoschCompany: Robert Bosch GmbHBrand value: US$9,816 millionHeadquarter city: MunichIndustry: Conglo..
AudiCompany: Volkswagen AGBrand value: US$8,580 millionHeadquarter city: IngolstadtCategory: CarsYea..
LidlCompany: Lidl Stiftung & Co KGBrand value: US$8,178 millionHeadquarter city: NeckarsulmIndus..
AllianzCompany: Allianz SEBrand value: US$7,707 millionHeadquarter city: MunichIndustry: InsurerYear..
NiveaCompany: BeiersdorfBrand value: US$7,344 millionHeadquarter city: HamburgCategory: Personal Car..
FantaCompany: The Coca-Cola CompanyBrand value: US$6,315 millionHeadquarter city: Atlanta, USACatego..
Porsche AGCompany: Volkswagen AGBrand value: US$5,658 millionHeadquarter city: StuttgartCategory: Ca..
KnorrCompany: UnileverBrand value: $4,512 millionHeadquarter city: HeilbronnCategory: Food..
VolkswagenCompany: Volkswagen AGBrand value: US$4,136 millionHeadquarter city: WolfsburgCatego..
Deutsche PostCompany: Deutsche Post AGBrand value: US$3,749 millionHeadquarter city: BonnIndus..
Deutsche BankCompany: Deutsche Bank AGBrand value: US$3,591 millionHeadquarter city: Frankfurt..
SparkasseCompany: Sparkassen-Finanzgruppe GmbH & Co. KGBrand value: US$3,137 millionHeadquarter ..
1&1Company: United Internet AGBrand value: US$2,706 millionHeadquarter city: MontabaurIndu..
EdekaCompany: Edeka Zentrale AG & CoBrand value: US$2,341 millionHeadquarter city: HamburgCatego..
DPDCompany: Le Groupe La PosteBrand value: US$2,316 millionHeadquarter city: AschaffenburgCategory: ..
SchwarzkopfCompany: Henkel AG & CompanyBrand value: US$2,303 millionHeadquarter city: D&uu..
MieleCompany: Miele & Cie. KGBrand value: US$2,250 millionHeadquarter city: Gütersloh..
LufthansaCompany: Deutsche Lufthansa AGBrand value: US$2,142 millionHeadquarter city: FrankfurtIndus..
Hugo BossCompany: Hugo Boss AGBrand value: US$2,072 millionHeadquarter city: MetzingenCategory..
MetroCompany: Metro Wholesale & Food Specialist AGBrand value: US$1,806 millionHeadquarter city:..
PumaCompany: Puma SEBrand value: US$1,369 millionHeadquarter city: HerzogenaurachCategory: ApparelYe..
REWECompany: REWE GroupBrand value: US$1,336 millionHeadquarter city: CologneCategory: RetailYear fo..
TUICompany: TUI AGBrand value: US$1,257 millionHeadquarter city: HannoverIndustry: Travel Agen..
KauflandCompany: Kaufland Stiftung & Co. KGBrand value: US$1,249 millionHeadquarter city: ..
CommerzbankCompany: Commerzbank AGBrand value: US$1,219 millionHeadquarter city: Frankfurt am ..
HypoVereinsbankCompany: Unicredit SpABrand value: US$999 millionHeadquarter city: MunichCategory: Ba..
KrombacherCompany: Krombacher Brauerei Bernhard Schadeberg GmbH & Co. KGBrand value:..
OttoCompany: Otto GroupBrand value: US$912 millionHeadquarter city: HamburgCategory: RetailYea..
WESTCompany: Imperial Brands PLCBrand value: US$877 millionHeadquarter city: HamburgIndustry: ..
TCHIBOCompany: Maxinvest AGBrand value: US$854 millionHeadquarter city: HamburgCategory: RetailYear ..
ERGOCompany: ERGO Group AGBrand value: US$810 millionHeadquarter city: DusseldorfCategory: Ins..
HasseröderCompany: Anheuser Busch InBev SABrand value: US$792Headquarter city: Leuven, BelgiumC..
OBICompany: Warenhandelsgesellschaft KGBrand value: US$759 millionHeadquarter city: Wermelskir..
HiPPCompany: Hipp GmbH & Co Vertrieb KGBrand value: US$744 millionHeadquarter city: Pfaffen..
Ritter SportCompany: Alfred Ritter GmbH & Co. KGBrand value: US$706 millionHeadquarter city: Wal..
HermesCompany: Hermes Europe GmbHBrand value: US$706 millionHeadquarter city: HamburgCategory: Logis..
BILDCompany: Axel Springer SEBrand value: US$696 millionHeadquarter city: BerlinCategory: Publishing..
AralCompany: BP PlcBrand value: US$618 millionHeadquarter city: Bochum &n..
Dr. Oetker COMPANY DR. AUGUST OETKER KGBRAND VALUE: US$610 millionHEADQUARTERS B..
WagnerCompany: Nestlé SABrand value: US$519 millionHeadquarter city: Nonnweiler-Otzenha..
HUK-CoburgCompany: HUK-CoburgBrand value: US$518 millionHeadquarter city: CoburgIndustry: Insu..
Beck’sCompany: Anheuser-Busch InBev SABrand value: US$1,946 millionHeadquarter city: Leuven, B.. It is possible not only to measure the value of brands from Germany, but also to assess the st..
How strong brands today prepare for the path ahead Hartmut SchefflerMD / CMOKantar TNSHartmut.S..
How German-ness shapes and reflects on local brands Christoph ProxCEOKantar Added ValueChristop..
Building value for budget brands Bernd BuechnerManaging Director, GermanyKantar Millward BrownB..
Navigating a brave new world Christian ThronManaging Creative DirectorDeepblueChristian.Thron@d..
With prestige brands like BMW, Mercedes-Benz, Porsche, Volkswagen and Audi all calling Germany home,.. 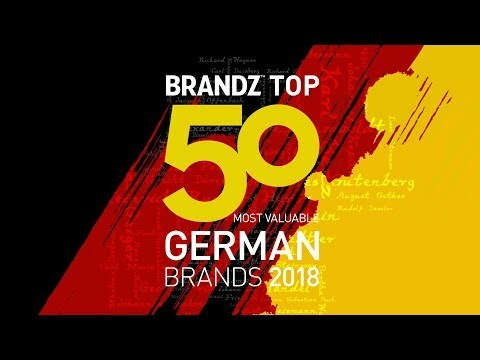 The value of the BrandZ Top 50 Most Valuable German Brands 2018 is highly concentrated at the top of.. The gradual digitization of consumers’ lives is being reflected in the way brands are deciding.. There are some brands that punch well above their financial weight in the BrandZ rankings by focusin..